The 6 Junction Droplet Chip, Fluorophilic is a glass microfluidic device designed for the parallel generation of 20 µm - 60 µm water-in-oil droplets at 6 separate flow focussing junctions. 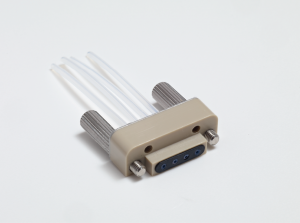 It is compatible with the Multiflux-2 Linear Connector 7-way and the Multiflux-2 Double Top Interface for quick and reliable fluidic connection from tubing to chip. 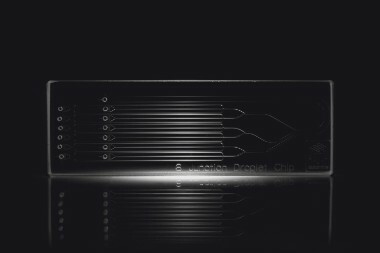 The 6 Junction Droplet Chip, Hydrophobic is a glass microfluidic device designed for the parallel generation of 20 µm - 60 µm water-in-oil droplets at 6 separate flow focussing junctions. It is compatible with the Multiflux-2 Linear Connector 7-way and the Multiflux-2 Double Top Interface for quick and reliable fluidic connection from tubing to chip. The 6 Junction Droplet Chip is a glass microfluidic device designed for the parallel generation of 20 µm - 60 µm oil-in-water droplets at 6 separate flow focussing junctions. 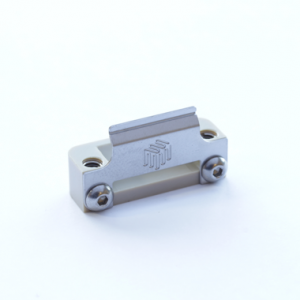 It is compatible with the Multiflux-2 Linear Connector 7-way and the Multiflux-2 Double Top Interface for quick and reliable fluidic connection from tubing to chip. Compatible with Dolomite Multiflux®-2 Linear Connectors for quick and reliable fluidic connection.